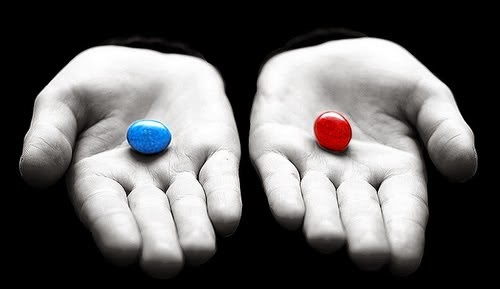 Eudaemonia: Was it the Blue Pill, or The Red? Right there with you. I look forward to reading your thoughts again! Going to subscribe (no pressure...ha!). I'm so glad to see you here, sharing your gift with words, working out the issues that keep us up at night. You are a beautiful writer and you have important things to say. I hope you'll continue to write and work it out and post here whenever the mood strikes. Yes, I've found facebook certainly not conducive for working through anything. The blog does help. My old, lovely blogging friends! I'm so happy you are here. I feel a bit like the tin man on the yellow brick road, all frozen up and just waiting for someone to come along with an oil can. Thanks to you all for coming along. I have some thoughts that have been rattling around in my brain since the summer. I will soon try and make some sense of them here and of course, I'll be asking for you to join me. Thanks guys. Thanks for still being around after all this time. And...I managed to turn off the comment moderation. Hopefully, the spam situation is under control. Lisa, what an amazing surprise! I've missed you! I'm glad I'm not the only one who feels ambivalent (personally happy but almost paralyzed with fear about the world.) It's good to see you writing and I look forward to more. After posting a rare article on "Home in the Railroad Earth," I was pleasantly surprised to see this one. I'm still hooked on Facebook, but haven't figured out Twitter. Welcome back!